This was a compromise where Missouri wanted to be a slave state while Maine as a free state. This compromise made the line of 36, 30 and South to be slave states while Maine joined as a free state. 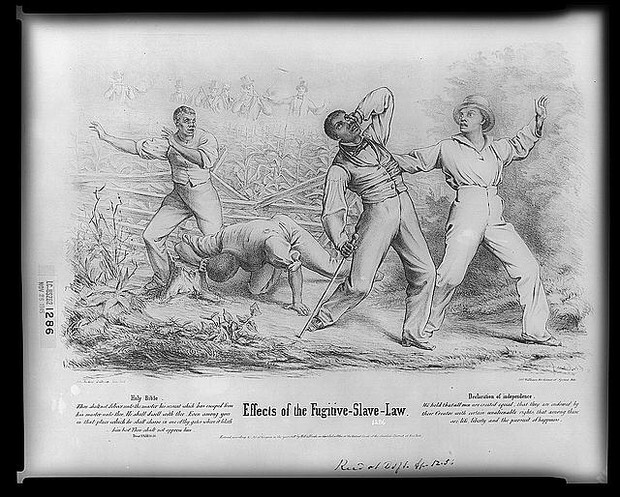 Northern states realized the issue of slavery was becoming more and more of a conflict. They began protesting and noticing the issue. Southern states reawakened old fears that the North's point of view represented a threat to slavery. They were scared the economy of slave owning could be damaged to taken away. Compromise where California is admitted as a free state and Utah and New Mexico as popular sovereignty where people vote for or against slavery. The domestic slave trade was also prohibited and the Fugitive Slave Law was made to help find runaway slaves. The Northern states approved this compromise for the goal to preserve the union and not for the Fugitive Slave Law. 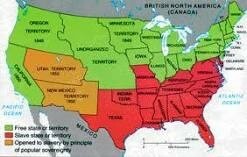 The Southern states approved but warned that the breakdown of the agreement would result in secession. They also supported the Fugitive Slave Law too. This law was a result of the compromise of 1850 where all runaway slaves will be brought back to their owners. This worried Northern states that African American were coming to the North and to Canada to escape prosecution under the Fugitive Slave Law. It brought slavery into the north and abolitionists were very vocal in their dislike but did not use violence. The Southern states were pleased of this law because their slaves had a better chance of getting caught running away, but would be brought back immediately. This was a novel created by Harriet Beecher Stowies showing how cruel slavery was, which created a widespread anti-slavery support. The Northern states took notice of how cruel slaveowners were and created a support widespread for anti-slavery. The Southern states were offended by what they read in this book saying they do this and that and they started to hate the Union even more. This was an act that allowed Nebraska and Kansas to join as a popular sovereignty state to vote for slavery or not. 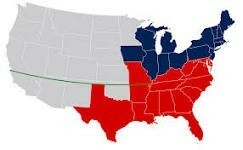 It kind of repeated the Missouri Compromise. Northerners were outraged because it repeated the Missouri Compromise. It pleased the Southerners because it opened another spot for possible slavery. 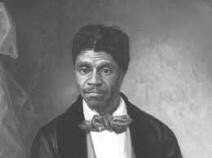 This was a decision between a slave, Dred Scott, suing his owner for living with him on free soil in the North. The Chief Justice ruled that slaves were not people and they were property. He ruled the Missouri Compromise unconstitutional in this problem. The lawsuit did not go by because he was a slave. The Northerners were dismayed and began joining the Republican Party in droves. They believed that this broke a law somehow. The Southerners were overjoyed at the ruling and were pleased. They could own slaves and travel to places they thought. It gave them a new thought. 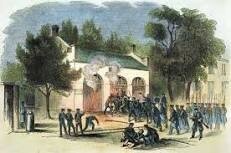 This was a slave uprising raid by John Brown and other abololitionists on the Federal Arsenal. They wanted to change and make a move for slaves. They also invited slaves to join but none followed them. The Northerners were mourning his death but didn't support his actions for raiding and murdering. They believed he had the right mind track. The Southerners were threatened by John's actions and felt offended someone would do that. They began to think really badly about abolitionists. This was a presidential election between four people, Stephen Douglas, John Breckenridge, John Belland, and Abraham Lincoln. Lincoln won the election and the Southern states seceded from the Union to become the Confederate States of America. The Northerners felt that Stephen Douglas would win because he didn't support slavery. Lincoln didn't have a clear opinion on slavery. The Southerners would not believe Lincoln would keep slavery so they seceded and Jefferson Davis became the president of the Confederate States of America.